Car Dealers and Car Rental businesses spend thousand dollars to bring shoppers to their websites. And still there is an important task to engage those visitors and convert prospects to effective leads. Is there a solution for this? – Yes! A Live Chat software is not a novel concept of today. Thousands of businesses have been successfully using it for real time communications with their customers, for engaging new website visitors and for producing more leads and sales. 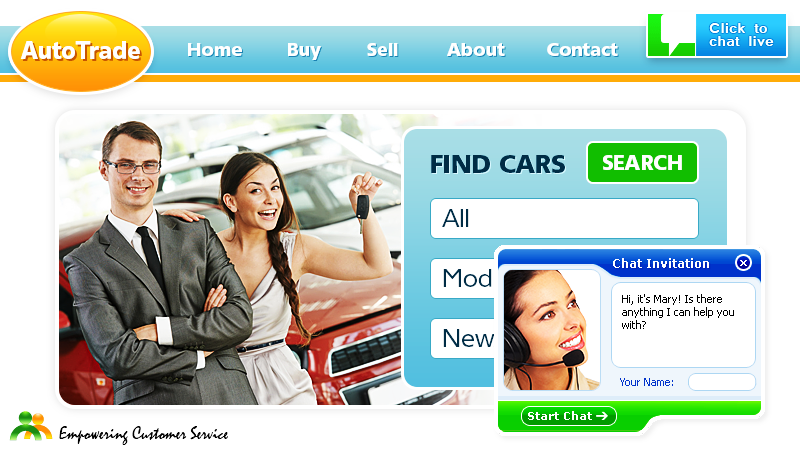 For online users looking for a car for rent or for those who are in search of a new vehicle it is very important to be sure that they deal with a real and trusted Company, thus it is highly recommended to brand the Live Chat with your Company logo and customize Chat Messenger to match your corporate website look and feel. Professionally looking chat screen and smiling sales agent’s picture will definitely add credibility to your business as well as human touch to the real-time conversations. Nothing matters more to prospects than an individual approach and superior customer service. As it’s a known fact today that if businesses invest into support and utilize cutting edge technologies for customer care, then customers satisfaction is the highest priority for those Companies. As all car dealers know, the best way to win a customer is to let this person choose the right vehicle meeting the budget, requirements and needs. It has been always a tough and time consuming task to describe the car in words by phone or to send a great deal of technical characteristics, features and options data by email. And still there was no possibility to know for sure, whether the customer still hesitates or has already made the decision. With the Live Chat tool all this can be done during a real time conversation: file transfer option allows sending files during the chat sessions, by following prospects with a Co-browser you can see which pages they are looking at and thus which vehicles they are interested in. With the Co-browser and page push option, you can easily navigate your prospects through your website, leading them to the right decision and taking into account all comments, questions and concerns which arise during Live Chat sessions. How easy is to rent a car? Just fill out a rental form and pay you will say! But if the customer has concerns, some questions or does not see any vehicles for rent in his / her location? Then next step is to contact the car rental agent. But how easy is it to reach the right person using available contact options on your website? If the prospect is on a tight schedule, the best option would be to offer assistance though a Click to Chat tool, answering customer’s questions in a real time chat and arranging everything fast and efficiently. Otherwise, the prospective customer will be forced to search for another car rental service, offering more customer friendly support options. Integration of the Live Chat tool with your website will not take much of your time and the results can be evaluated during the free trial, which is normally offered by Live Chat vendors. Just three easy steps and the Online Chat Button is on your website, showing your prospects that there is a live person on the other side, ready to assist them. This entry was posted in Articles and tagged car dealer chat, live chat for automotive business. Bookmark the permalink.